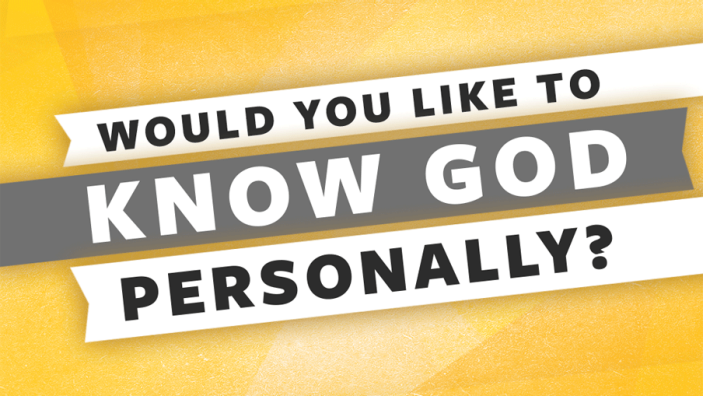 The most effective way to share the Would You Like To Know God Personally? booklet or the Four Spiritual Laws is to simply read it completely through with the person you are witnessing to. Fold the booklet in half and point along with your finger or pen as you read the words. No big Bible message or extra illustrations are needed. Just read the booklet. With this in mind, the Big Six are questions, which serve only to clarify that which is already in the booklet, not add to it or lead you on any tangent. I can say with certainty, that if you memorize and use the Big Six, you will be more effective in communicating the Gospel message and making it crystal clear. I guarantee you can memorize these questions in 5-10 minutes. The six questions are incredibly simple and will let you know if the person you’re witnessing to really understands the message in the booklet. They have to tell you what the booklet means – that’s the secret. They will understand the Gospel because you will give them three opportunities to review the Biblical message of the booklet. What follows is the text (word-for-word) of the Would You Like to Know God Personally? booklet. Each question is inserted in this presentation at the exact point where you would ask it. God loves you and created you to know Him personally. He has a wonderful plan for your life. People are sinful and separated from God, so we cannot know Him personally or experience His love and plan. QUESTION 1. How would you define sin? Can be answered 100 different ways. In fact there is no wrong answer. Anything that is not pleasing to God or goes against His Word is sin. Everyone will get the answer to this question because there are many ways to sin. They’re telling you in their own words what sin is by giving you one example. People were created to have fellowship with God; but, because of our own stubborn self-will, we chose to go our own independent way and fellowship with God was broken. This self-will, characterized by an attitude of active rebellion or passive indifference, is an evidence of what the Bible calls sin. QUESTION 2: Have you ever sinned before? This question on the surface sounds too simple, but it is perhaps the most significant in the booklet. To clearly and honestly admit that one has sinned, shows one’s need for forgiveness. God’s requirement to get into heaven is perfection. Nobody is perfect, so somehow we all need to find forgiveness in God’s eyes. They will be in a dilemma after they’ve answered this question. Humanly speaking, there’s no way to work back to perfection. Jesus Christ is God’s only provision for our sin. Through Him alone we can know God personally and experience God’s love and plan. QUESTION 3: Why did Christ die on the cross? Don’t answer this question for the person, let them tell you first. The answer is found in the first five words of the next verse you’ll read in 1 Corinthians 15:3-6 “Christ died for our sins...” That’s the Gospel message, the good news. You’ll come back to review this point again. “Christ died for our sins...He was buried...He was raised on the third day according to the Scriptures... He appeared to Peter, then to the twelve. After that He appeared to more than five hundred...” (1 Corinthians 15:3-6). This diagram illustrates that God is holy and people are sinful. A great gulf separates the two. The arrows illustrate that people are continually trying to reach God and establish the personal relationship with Him through our own efforts, such as a good life, philosophy, or religion - but we inevitably fail. “For it is by grace you have been saved, through faith —and this is not from yourselves, it is the gift of God — not by works that no one can boast” (Ephesians 2:8,9). This is the big clarifying question in the booklet. It allows you to see if they fully understand the first three points in the booklet. The answer is we are saved by placing our trust in Christ’s death on the cross to pay for one’s sins (by grace, gift of God), not by works (not from yourselves). Go back and review pages 4-5 of the booklet by simply asking: “What is it that separates one from God?” The answer is sin. Look at point three of the booklet (pages 6-7) and ask: “ Once again, why did Christ die on the cross?” The answer is to pay for our sin. Ask: “Is there anything in our own power that we can do to get rid of our sin?” Answer: no. In essence, what you’ve just done is reviewed the key points of the booklet again. This repetition is good and really clarifies the gospel to them. They are telling you what the Gospel is! Basically, don’t try to remember these extra questions, just ask questions two and three again, using your own words. The same is true for the extra questions in Question Five below. QUESTION 5: What is the main difference between the circle on the left and the circle on the right? Again, always give the person the opportunity to answer first and think about it. The answer is where the “cross” is. In the circle on the left Christ is outside the life. In the circle on the right, Christ is in the life. Ask: “If Christ is in someone’s life, what is one of the most important things that He’ll do for them? Answer: forgive them of their sin. Ask: If Christ forgives someone of their sin, is there anything that would stand between them and God? Answer: nothing, Christ did it all on the cross. Question five gives you a second full opportunity to let them communicate back to you the gospel message in points 2 through 4 of the booklet. QUESTION 6: What is the main thing that this prayer is saying? Now re-ask the extra questions under Questions Four and Five. By now they will really know the message and will know exactly the commitment they’re making if they pray the prayer to receive Christ on page 10. How can we help agnostics know and follow Christ? Let’s look into the life of one former skeptic and the tool he developed to help us better converse spiritually with others.